When you're planning a party, the easiest way to keep guests satisfied is to offer dips and spreads. These simple appetizers allow everyone to snack away and they don't take long to prepare. From cheesy dips for chips to creamy spreads for crackers and savory blends for baguettes, there's sure to be a recipe that will fit your next get together. 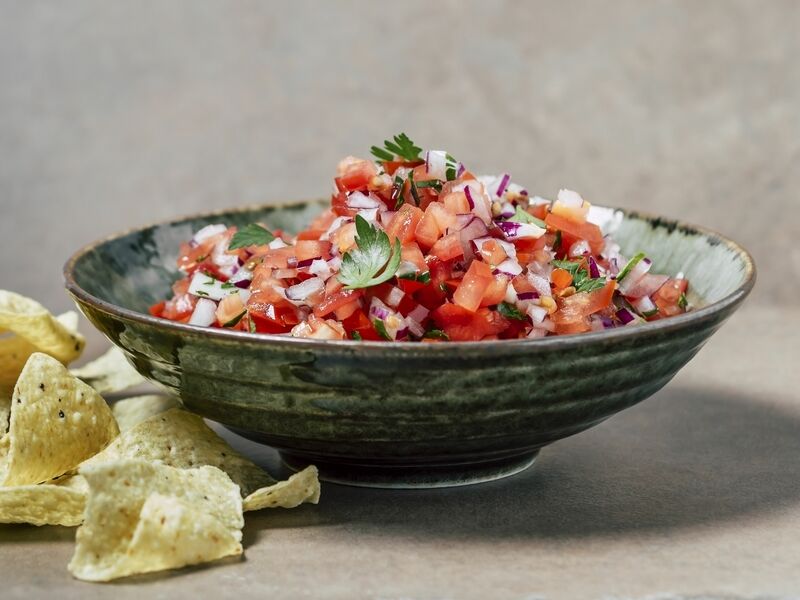 Game day parties and picnics are the perfect time to bring out a homemade salsa. This is a spicy recipe, featuring a habanero pepper, chopped tomatoes, onions, and cilantro, and takes just minutes to prepare. Chili con queso is also sure to please. It's incredibly easy to make in your crock pot. Requiring common ingredients and featuring real cheddar cheese, this is a recipe you'll rely on time and again. Three ingredients and your crock pot are all you need for a great chili cheese taco dip. Made with ground beef, canned chili, and Velveeta, it's a recipe anyone can pull off. A Mexican seven-layer dip is a ton of fun for any party. It has everything that ​makes tacos great, it's simply served in dip form. Adults and kids will love it and it's surprisingly healthy. With refried beans, taco seasoning, and Monterey Jack cheese you can make an easy and delicious refried bean dip. It's a great one for your slow cooker. Guacamole is always a hit and it is not difficult. You'll spend most of your time cutting up the avocados and vegetables. From there, you just have to mix it all up. Don't want to mess with hot wings? Buffalo chicken dip is the next best thing. It includes rotisserie chicken, cream and blue cheeses, and hot sauce. This one may become a new favorite. Even pizza can be transformed into a dip. This easy pizza dip recipe is a deconstructed pepperoni pizza. Serve it with Italian bread bites and everyone will be happy. Whether it's served in a fondue pot or slow cooker, the beer cheese dip is great for longer parties. It's perfect for a variety of dippers, including crackers, chips, bread, veggies, shrimp, or sausage. Broccoli cheese dip is a guaranteed hit for your favorite dippers. It's easy to prepare and can be customized in a variety of ways for an extra zing of flavor. The artichoke Gruyere dip is a great choice for ​fancier affairs. The recipe is baked and has a rich flavor, though it's lighter than most. It's fabulous with crusty bread bites. A restaurant favorite, spinach dip is easy to make at home. This no-bake recipe requires nothing more than mixing the ingredients. It can also be warmed up or served in a bread bowl. 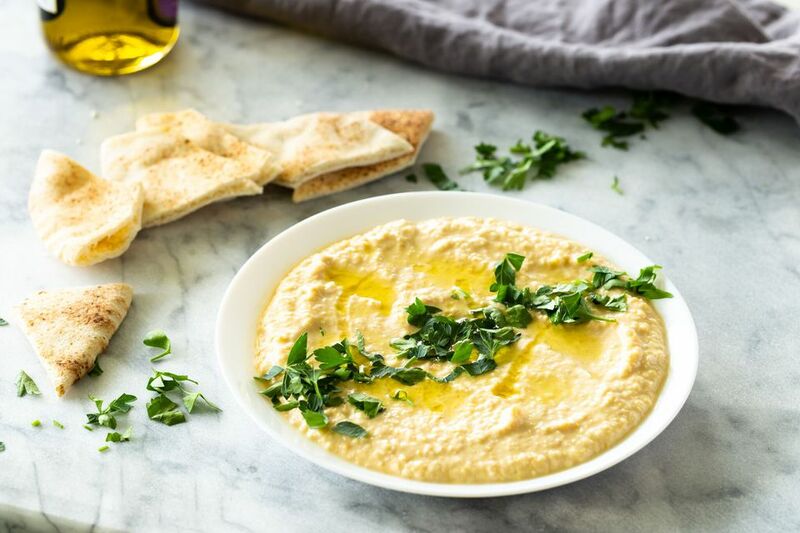 Forget the store-bought varieties and try a classic hummus recipe. With chickpeas and tahini, it will outshine any prepared hummus at the market. Roasted red pepper hummus is a favorite flavor variation on this popular vegetarian dip. It has a wonderful zest that is fantastic with warm pitas and vegetables. Black beans are a nice substitute for chickpeas. The black bean hummus is flavored with garlic, tahini, lemon, cumin, and cilantro and it's tasty with pita or tortilla chips. Similar to hummus, the garbanzo bean pesto dip is a nice change. It combines the beans with sour cream, basil pesto sauce, and red bell peppers. Serve this one with crackers or fresh vegetables. Take your average bean dip to the next level with the sun-dried tomato and goat cheese bean dip recipe. With a mix of white beans and garlic, it's a great alternative to hummus. Matbucha is a Moroccan dish that is as popular as hummus in Israel. It combines tomatoes, jalapeno or bell peppers, and paprika, so it's almost a mild salsa. To follow tradition, serve it with warm pita bread. Baba ghanoush is a tasty eggplant-based dip found in the Mediterranean and the Middle East. This recipe is fat- and gluten-free as well as vegetarian-friendly. It's perfect for a diverse group of party guests. Olive tapenade is great with toasted baguettes or flatbread and it can be used on top of your homemade hummus. The vegan olive tapenade is a nice alternative because it skips the anchovy paste. For a veggie plate, a simple blue cheese dip is a great choice. It's also a dipper for your favorite hot wings and you can make it into a thicker spread for crackers and bread. You'll want to make plenty of Greek tzatziki because it disappears fast on a vegetable platter. This easy cucumber, garlic, and yogurt dip is best after sitting overnight, so be sure to plan ahead. A Benedictine dip is a classic vegetable dip. This recipe combines cucumber, cream cheese, onion, and mayonnaise and it should be a vivid green color, so it's perfect for spring and summer parties. Seafood should not be reserved for dinner entrees, it makes fantastic appetizers as well. Cooked in a slow cooker, the hot seafood dip uses lobster, crab, and shrimp in a melty, gooey mix of cheeses. Serve this one with bread cubes. Sure, you can dip shrimp in a shrimp dip, but it also works with vegetables or crackers. A no-cook recipe, you will only need canned shrimp, lemon, onion, cream cheese, and a bit of mayo. The baked crab dip recipe is an impressive choice. It's very easy and people love serving it for the holidays. Serve it with fancy crackers, bagel chips, and veggie sticks. The smoky, tangy flavor of smoked salmon and crème fraiche is sure to wow anyone at your party. It's the perfect topping for cucumber slices, though it's also nice on toasted bread. Taramosalata is a traditional Greek carp roe caviar spread that will dazzle everyone's taste buds. Best with pita triangles, the recipe combines soaked bread with tarama (the caviar), onion, olive oil, and lemon juice. A fish pâté may sound fancy, but it's rather easy. Simply toss your favorite smoked fish into a food processor with a few common ingredients. Then let it chill overnight and serve it with bread or crackers. The lentil pâté is almost as simple, though you have to do a little work ​on the stove first. Nonetheless, the combination of lentils, onion, garlic, and pepper is definitely worth five more minutes of your time. If you enjoy canning, keep a jar of this delicious sweet bell pepper relish in the pantry. When you need a fast appetizer, simply pour it over cream cheese and you have an instant dip for crackers or bread. A blueberry chutney is another kitchen staple that puts a fruity twist on a cheese spread. Freeze it during blueberry season and you have three months to use it over Brie or cream cheese. Break out the rye rounds or melba toasts, the cheesy Reuben dip is a unique appetizer. It transforms the favorite sandwich into a dippable delight straight out of the crock pot. Chopped liver is a great spread for crackers, crudites, and bread, but a mock version is far easier. The green bean walnut chopped liver recipe is vegetarian and pareve (meat- and dairy-free), so it's something everyone can enjoy. A cheese ball will impress everyone and the salmon ball will show you just how easy it is. Coated with nuts, the ball includes cream cheese, dill, and horseradish. When surrounded by a variety of crackers, it makes a great looking appetizer plate. Nicknamed the "cheese ball of darkness," this is a guaranteed showstopper, especially for Halloween. It's filled with spicy jalapeño peppers and sweet peaches then rolled in black sesame seeds. A classic recipe, pimento cheese spread is one you can make days in advance. The creamy spread works great on bread, crackers, or apples. Korozott is a Hungarian goat cheese spread that combines the cheese with green onions, caraway, and paprika. It's an intriguing flavor and another great option for toasted bread or as a vegetable dip. The basil walnut spread is perfect for summer parties. It has a flavor that's similar to pesto and includes Parmesan and cream cheeses. This one's perfect for baguettes or an assortment of crackers. For a chunkier cracker spread, try the zesty chicken salad. It's a fine option that uses mashed chicken, cream cheese, ranch dressing, and Dijon along with a few spices. This Baked Cheesy Pizza Dip Will Wow Your Friends and Family! Peanut Butter — Super Easy to Make!